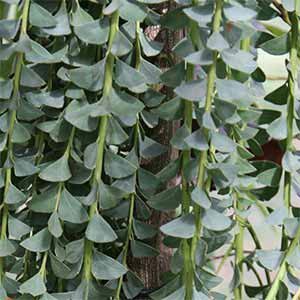 This is a fascinating variety, and Acacia cultriformis can be used as a ground cover plant (prostrate form), small shrub or, if you can find it, the cascading form, sold as a grafted standard. With a natural weeping habit, this is an Acacia with dense growth, masses of foliage and covered in golden balls of flowers from winter through spring. Grow the prostrate form along the top of a retain wall and let it naturally hang over the edge. You will have a green curtain of foliage year round, and a yellow curtain when in flower. The grafted standard form makes a great feature plant. If you are growing the standard form it will be grafted. As with most grafted plants, you do need to stake the plant until the stem or trunk strengthens enough to support the head. A slow release native plant fertiliser once a year will be adequate in most soils. Acacia cognata ‘Waterfall’ is another cascading Acacia grown as a weeping standard. Foliage – Deep silvery green and triangular in form. Flowers – Small balls of yellow flowers. Pruning – Grafted varieties (standards) will need to have all growth below the graft removed regularly.